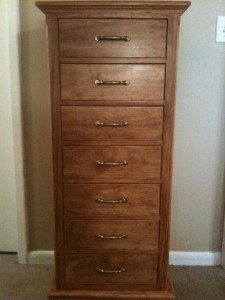 This chest design comes from PlansNow.com. The carcass of this particular piece is constructed from select pine available at our local Lowe’s store. They carry a hardy supply and I was able to hand-pick each board according to its use and placement. The drawer fronts are dovetailed to the sides and the drawers have fixed wooden runners instead of mechanical guides for decades of maintenance free use. The drawer sides and back incorporated 1/2” oak plywood I already had in the shop. The finish is a single coat of cherry stain and three coats of polyurethane (Clear Satin). Preparing the wood for the stain with a wood conditioner gave this pine project a beautiful even finish. The plans were simple and easy to follow, making this project very enjoyable. The cost of materials, minus drawer handles, was right at $100. The construction took approximately 15 hours, less sanding and finish. Additional thoughts and notes:- Dovetailing 1/2” plywood is a trick I have not yet mastered. It was difficult for me, and may be impossible to do so, without blowing out part of the backs of the tails. In future projects, I will use solid wood. Although the backs of the tails are not visible after construction, they left this craftsman feeling challenged to do better. – I stained the dovetailed drawer fronts prior to connecting them to the sides. I like the contrast of the joint by staining the front and giving the sides a clear coat of finish (see photo of this project). – Pine is a very economical alternative to hardwoods. However, extra care must be given as these pieces are more susceptible to dents and scratches. – A raw pine board that has a few “dents” here and there can be brought back to life by placing a drop of water in the dent. Within minutes, the wood swells the board back to a nice, even surface. Get your free plans here! 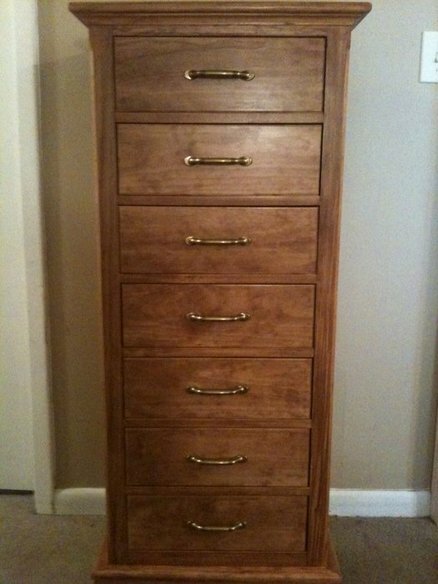 Be the first to comment on "Seven Drawer Chest"